As this site’s first book review, I’ve chosen the aptly titled, The Poisoner’s Handbook: Murder and the Birth of Forensic Medicine in Jazz Age New York. 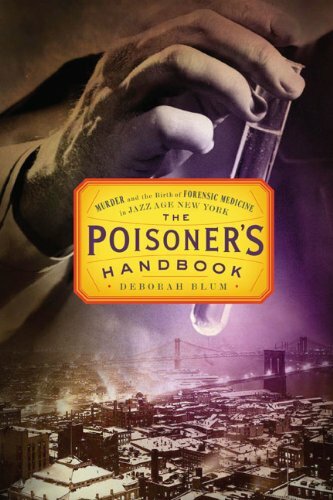 Author Deborah Blum presents the true story of Dr. Charles Norris, Manhattan’s first trained medical examiner, and toxicologist Alexander Gettler and their efforts to create standardized methods for identifying poisons. I truly enjoyed this book. It was fascinating to learn about the foundations of modern forensic science, particularly toxicology. The chapters, named for poisons like Arsenic, Chloroform, and Carbon Monoxide, were rife with information that any mystery writer could use. I only wish the author could have included more (notably absent was Aconite). Additionally, details about Prohibition in New York City added to the narrative. Blum doesn’t present the glamorous side of the era as so often seen in the movies of speakeasies and gangsters. Alcohol poisoning was an all too common and deadly occurrence. The lengths the U.S. government took to discourage alcohol consumption and the reciprocal efforts made to obtain alcohol for consumption were disturbing to say the least. The author also touched on infamous crimes of the 1920s. Mystery fans will recognize the real-life murder used as the basis for The Postman Always Rings Twice and Double Indemnity and may recall the woman known as America’s Lucrezia Borgia. Blum also presented cases in which Gettler was able to clear a suspected poisoner using forensic methods. Ultimately, I recommend this for fans of the genre and especially for creators planning to use poison in their next story. It’s not overly technical, and the chapters are conveniently divided by the various poisons featured. « Welcome to The Poisoned Martini!